The Santa Monica College Pete & Susan Barrett Art Gallery will be showing “African American Treasures: History and Art from the Collection of Bernard and Shirley Kinsey,” in accordance with African-American Heritage Month. The collection is a rare and historically rich assembly of art and materials that has been exhibited throughout the United States since 2006. This is the first time pieces from the collection will be at an institution of higher education, SMC officials said. The exhibit opens Tuesday, Feb. 12, with the opening reception being held on Saturday, Feb. 16 from 6 p.m. — 8 p.m. Before the reception, a book signing and gallery tour will be led by the Kinseys from 4 p.m. — 5 p.m. The exhibit will feature 26 original works of art and nearly 40 original items, artifacts, articles, posters, graphics, writings, photos and books, said art gallery director Marian Winsryg. The Kinseys, of Pacific Palisades, have been collecting items of historical and cultural significance throughout their more than 40-year marriage, exploring and celebrating their African-American heritage. The Santa Monica College Pete & Susan Barrett Art Gallery is located in the SMC Performing Arts Center on Santa Monica Boulevard at 11th Street. Gallery hours are noon — 5 p.m. Tuesday through Friday and 11 a.m. — 4 p.m. on Saturday. For more information, call (310) 434-3434. SAMOHI — In many ways, Justin Sardo is a typical 16-year-old student. He runs cross country and track for Santa Monica High School, and until this past year, even played a musical instrument. But looking a little deeper, he is anything but typical. He is so dedicated to his sport that he runs 50 miles every week, and also mentors younger kids to become runners. His musical instrument was a bassoon, a rare choice among other teens his age. Maybe this kind of individuality is what led him to start his own charity, Pocket Change, on the campus of Samohi. Sardo says he doesn’t care about change, and is always trying to get rid of it. He figures if others feel the same, then why not empty our pockets for a good cause? “If every student donates a quarter a day at Samo, we can make about $800 [per month],” Sardo explains. Collecting change will be as easy as dropping coins into one of five boxes at the school. The boxes were installed over winter break and paid for by the Sardo family. At the end of each month a check will be made out for the amount raised and be donated to a local charity. This month, the charity’s first, homeless services provider OPCC will be the nonprofit of choice. “In the future, once we get up and running, we might be letting students vote and decide what organization will be benefited for the month,” Sardo says. Laurel Fretz, principal of Samohi, thinks highly of Sardo. And it doesn’t end at the high school level. Sardo wants his charitable organization to expand to other schools as well. “This would really work at any level,” he says. 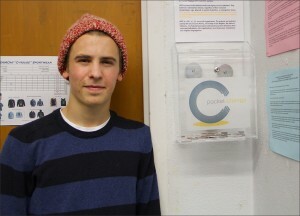 Pocket Change is inspired by a similar charity called Project Mailbox at Boston University that was created by a family friend of Sardo’s, Nick Dougherty. Sardo came up with the name for his charity, wanting to convey the idea that a little can go a long way. ST. MONICA — The St. Monica Mariners improved to 4-1 in the Camino Real League with their Thursday night win over the St. Joseph Jesters, 71-59. Basketball is a game of runs and this contest was loaded with them. The Mariners started off slow, giving up the first five points to the Jesters. Senior guard/forward Briana Harris then took matters into her own hands, scoring 10 straight points for St. Monica. St. Joseph responded with a 7-2 run to end the quarter, pulling to within four. To start the second quarter, the Mariners went on an 8-2 run, but again, the Jesters made a push and cut St. Monica’s lead to seven at the end of the half, 35-28. In the second half, St. Monica’s pressure defense started to take over, allowing only 10 points to St. Joseph in the third frame. But St. Joseph would not go away, scoring eight straight points in the first 90 seconds of the fourth quarter, highlighted by two back-to-back three-pointers by guard Lauren Hong. After a timeout, St. Monica scored five unanswered points, sealing the victory. Throughout the game, St. Monica’s star players, Harris and senior center Melissa Maragnes, were mired by foul trouble, prompting junior guard Katrina Balatico to step up. She finished with 17 points and 5 assists, making five shots from beyond the three-point arc. Mariner freshman Elena Kostadinov had a big night off the bench, scoring 14 points, eight coming in the second quarter alone. Maragnes would finish with 13 points, 7 boards and 5 assists. Despite flirting with a triple-double (25 points, 10 rebounds, and 8 assists), Harris was still a bit disappointed with her performance. “I could’ve done better with my free throws,” she said. For St. Joseph, junior forward Jazmine Gandhi and junior center Michele Pennala played well, each scoring 18 points. The loss puts the Jesters at just 1-4 in league play. St. Monica’s next game is a non-league match against the Marymount High School Sailors on Saturday. Tip-off is at 2:30 p.m. The high school is located at 10643 Sunset Blvd., Los Angeles. Rep. Henry A. Waxman (D-33rd District) and Sen. Sheldon Whitehouse (D-RI) have announced the formation of a bicameral Task Force on Climate Change to address the issue of global warming. The task force will be dedicated to focusing congressional and public attention on climate change and developing effective policy responses, and will be open to all other members of Congress interested in collaborating on the issue. In the coming weeks and months, Waxman and Whitehouse will hold meetings of the task force, seek relevant information and release reports, memoranda and correspondence in order to foster the group’s goal of increasing awareness and developing policy responses to climate change. On Saturday, Jan. 26, the Museum of Flying will be hosting its next aviation presentation, Douglas World Cruisers — First Around the World. It will be held at 11 a.m. and 1:30 p.m. The event will be presented by Bob Dempster, executive director of the Seattle World Cruiser Association. Dempster is currently involved in a project to build and fly a replica of the World Cruiser “Seattle” around the world in 2014, commemorating the 90th anniversary of the original journey. He will tell the story of the first world flight and also give a presentation on the Seattle II World Cruiser project. Of the four Douglas World Cruisers built by Douglas Aircraft Co. that embarked on a flight around the world on April 6, 1924, only two were able to complete the entire trip — the “Chicago” and the “New Orleans,” which is housed in the Museum of Flying. Paid admission will include the Seattle II World Cruiser project presentation and is free to members of the museum. General admission is $10 for adults, $8 for students and seniors, $6 for children aged 6 through 12, and free for children under 5. The Museum of Flying is located at 3100 Airport Ave. and is open Friday through Sunday from 10 a.m. to 5 p.m.
With about 40 restaurants being represented during dineLA’s Restaurant Week, Santa Monica foodies will have lots of menus to choose from. Local restaurants will offer specially priced lunch and dinner items costing no more than $25 and $45, respectively. So if you’ve ever wanted to eat at La Botte, or The Penthouse on top of the Huntley Hotel, Restaurant Week is the chance to do so. Owner and Chef Stefano De Lorenzo of La Botte said that during dineLA’s special week, he sees more people than usual in his restaurant and that it creates the opportunity for customers to get a good deal. It also gives the restaurant the chance to present new menu items, he said. dineLA’s Restaurant week is going on now through Feb. 1. For a complete list of restaurants that are participating, visit dinela.com. Now through Jan. 28, start getting healthier for free at two local places of fitness during Active Santa Monica week. Venues include the Fitness Room at Memorial Park and the Santa Monica Swim Center, city officials said. At Memorial Park, LIfeFitness strength training machines, hand weights and cardio machines will be available for use. The Fitness Room is located at 1401 Olympic Blvd. and is open Monday through Friday, noon to 9 p.m. On Saturday and Sunday, it is open from noon to 7 p.m. No membership is required. For age requirements and additional information, call (310) 458-2201. Three classes will be offered at the Santa Monica Swim Center. The classes are Shallow Wet Water Workout, occurring Sundays at 8:15 a.m. and Mondays and Wednesdays at 7 p.m., Deep Wet Water Workout, which takes place on Sundays at 9:30 a.m. and Tuesdays and Thursdays at 7 p.m. and Adult Fitness Swim, which happens on Tuesdays and Thursdays at 7:30 p.m. The Wet Workouts are low-impact and integrate aerobic exercise with strength-training. All skill levels are welcome in either class. However, Deep Water Workout participants must be able to swim one pool length. The Adult Fitness Swim is for those who would like to improve their technique and form, as well as develop endurance and physical fitness with the help of an expert coach. For more information on these classes, visit smgov.net/swim. To find out more about Active Santa Monica, visit their facebook page at facebook.com/ActiveSM.